The couple share four children together. Source: Instagram/hilariabaldwin & Getty. Hilaria Baldwin shared another sad update with fans on Tuesday as she revealed she was heading to an appointment to find out if her baby was still alive, just days after announcing she was “likely experiencing a miscarriage”. 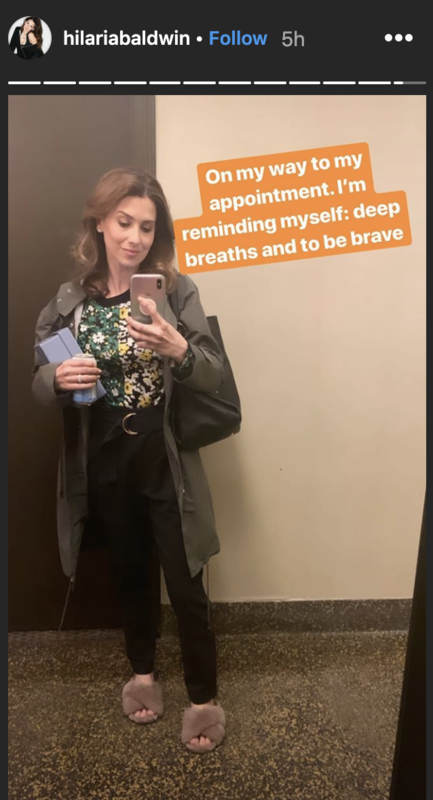 The wife of actor Alec Baldwin posted a photo of herself on social media alongside the words, ‘I’m reminding myself: Deep breaths and to be brave’, as she revealed she was on her way for a check-up. The post came after Hilaria appeared on US show Today, where she revealed she was “pretty sure” the pregnancy was not going to be successful. Hilaria, 35, had not yet announced she was expecting her fifth child prior to publicly revealing her fears that she was losing her baby on Friday, having only been in the early stages. However she shared an image of herself standing in front of a mirror in her underwear, showing off a tiny baby bump, as she explained that she wanted to stick to her word, having previously promised that she would keep her fans updated on every stage of her pregnancy, should she fall pregnant again. The 35-year-old shared another update on social media. Source: Instagram/hilariabaldwin. Hilaria added: “I don’t want to keep this from you, just because it isn’t as positive and shiny as the rest. I think it’s important to show the truth…because my job is to help people by being real and open. What do you think of her decision to announce the news so publicly? Do you have a message of support for the couple?